Relaxing watching TV on the sofa. 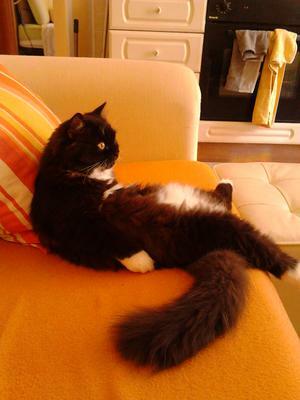 Tom often likes to spend the afternoon relaxing on the sofa. He looks like he's really concentrating on this wildlife documentary. What a cat's life! Cats just love sofas and they seem to always know the most comfortable position too. My own cats are always on my sofa and I'm constantly getting a hairy behind when i forget to clean the fur off before i sit down. I never thought cats could see the tv for a long time as they seemed to ignore it. But just lately my own cat will watch with we for ages. As long as there is some sort of action happening on screen to keep him interested. Love your picture of Tom, he certainly looks relaxed and enjoying his seat. My Dublin also loves TV, at least sometimes. If there are ostriches or horses or other cats or little birds or squirrels or swirling leaves or....well, you get the idea....he'll watch intently, even right up by the screen & swatting at it. Join in and write your own page! It's easy to do. How? Simply click here to return to Cat Poses.